The Nile Monitor is a species of reptiles extensively spread across its habitat. Known in different names like African small-grain lizard, water leguaan, or river leguaan, it is Africa’s largest lizard and a voracious predator at that. 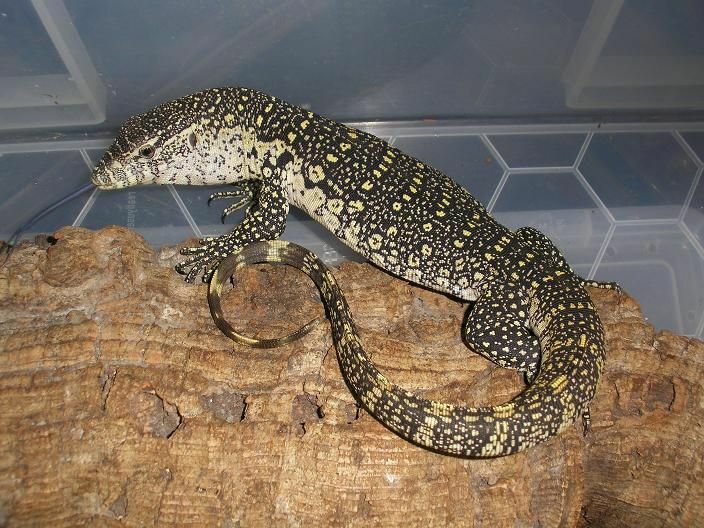 Because of their aggressive and unyielding temperament, with a powerful bite and a frequently-lashing tail, they are not known to make good pets, unlike many other monitor species. 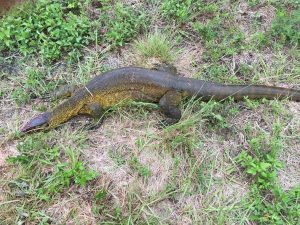 Size: Adult Nile monitors can be about 120 to 220 cm (3 ft 11 in to 7 ft 3 in) in length, with the largest recorded specimens measuring 244 cm (8 ft), and the average snout-to-vent length being 50 cm (1 ft 8 in). Weight: Body mass varies widely, with the largest recorded being 20 kg (44 lb). 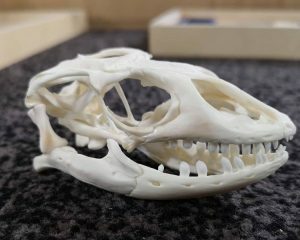 Head: The head is elongated and snake-like, with a wide mouth, small and black eyes, tiny nose/nostrils, and forked tongue. Body & Skin: The skin is tough and beady with greyish-brown and greenish-yellow on the dorsal side of the head, body, and tail along with yellow colored spots, while the underside and throat (ventral side) is ochre- to creamy-yellow. Feet: Strong, well-muscled feet bearing sharp claws for climbing, digging, defense, and tearing the prey. Teeth: Strong jaws with sharp and pointed in immature specimens, and become blunt and peg-like in the adults. Sexual Dimorphism: This species exhibits no differences between the sexes. 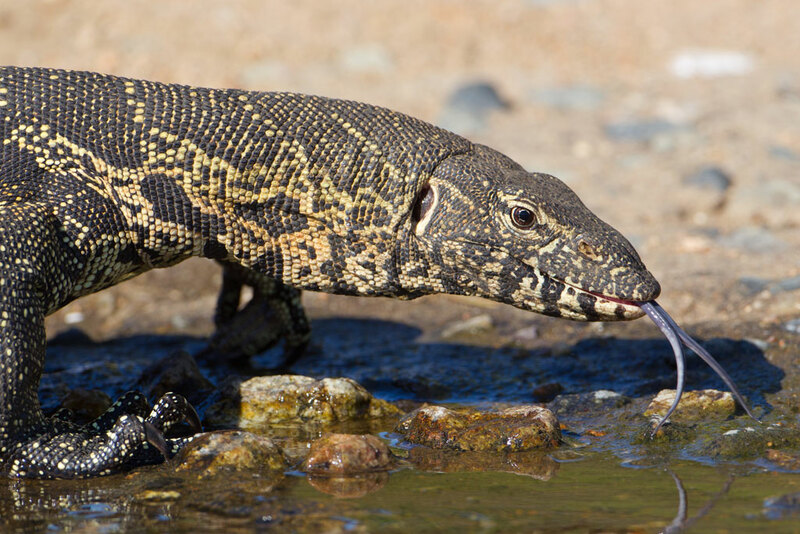 In the wild, the longevity status of the Nile monitor is 10 and 20 years, with an average of 10.6 years in captivity. 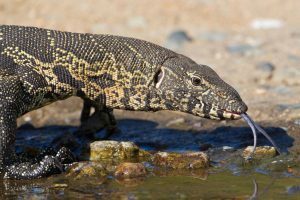 These large African monitors are scattered through much of sub-Saharan Africa – from Senegal to Somalia, down to northeastern parts of South Africa. They are also seen along the river Nile up into the southern regions of Egypt. 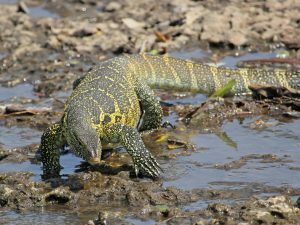 Nile monitors are found in a wide variety of habitats, typically close to permanent water bodies including grassland, scrub, forests, mangroves, swamps, lakes and rivers. No subspecies of this African monitor has yet been described by the biologists. The Nile monitors have a reputation for being ill-tempered and aggressive. They are primarily solitary creatures, roaming about and foraging for food alone, except during mating. At times, when they fall prey to larger animals like large snakes, they do not take time climbing up the nearest tree, using their strong, muscular legs. 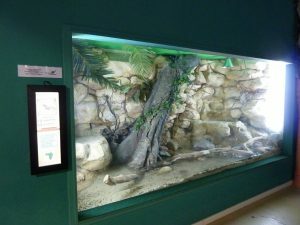 These monitors largely aquatic, and both great climbers and swimmers, and when they find a danger lurking at the bottom of a tree they are in, they would jump down from the branch into the safety of a river, stream, or similar water bodies. 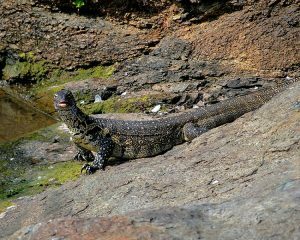 Nile monitors are highly carnivorous creatures, and wouldn’t hesitate eating up just any animal it believes consumable. They usually spend the early mornings, especially during winter, basking in the sun on the sandy banks or rocky surfaces by the river or stream, and have been seen cooling themselves in the waters particularly in the summer months. 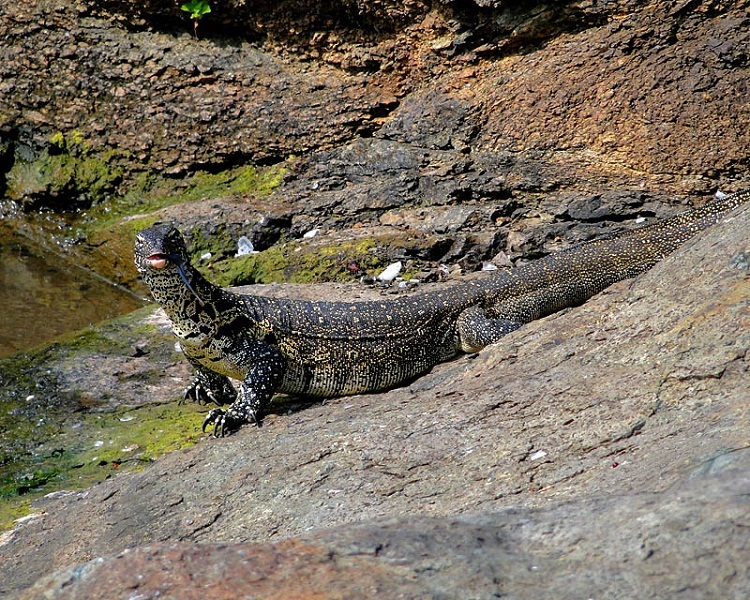 Nile monitors move on land, walking with wiggly gaits, often climbing up tall trees to feed, bask, or sleep. Nile monitors prey on almost all kinds of mammals, amphibians, fish, birds, reptiles, and eggs that they find in or around their habitat. The breeding season of these reptiles is during the rains. After a successful mating session, the female Nile monitor lays up to 60 eggs. For this, they prefer termite burrows or mounds. Interestingly, it takes a considerably long time for the eggs to hatch. 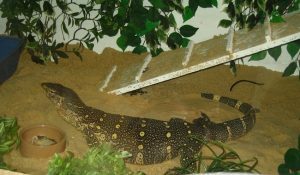 Under preferable temperature and optimum humidity, the Nile monitor eggs are incubated for around six to nine months before the young offspring hatch out. The baby Nile monitor hatchlings are brightly colored and spend the prime of their lives feasting upon snails, insects, spiders, and different other small animals. The juveniles attain the age of sexual maturity when they are around three to four years old. Reportedly, these semi-aquatic creatures have the respiratory adaptation of spending up to one hour submerged under water. Owing to its powerful leg muscles, the reptile is very fast for its size. Its strong, well-muscled tail is used both as a propeller while swimming, as also for defense purposes, if threatened or attacked, using it as a lash. Nile monitors are almost the apex predators within their range, except for a few large creatures like the Nile crocodile, and larger snakes like hamadryads. The skin of the Nile monitor has been used for various purposes – as dietary protein, in ceremonies and medicine, as also for leather goods, for many centuries. At almost 60 eggs per clutch, these big size monitor has the largest clutch size of any lizard. More than one million whole skins of the Nile monitor are required each year in the annual leather trade, especially in Indonesia. Nile monitor is the second largest reptile in the Nile River, next only to the Nile crocodile. 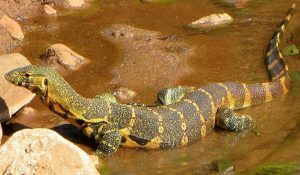 In the leather trade, the skin of the medium-sized specimens is valued, since the skins of the larger Nile monitors are too tough and difficult to shape.